Epps was released by the Sky on Wednesday. Epps was selected 33rd overall in the 2017 WNBA Draft, but struggled to find a role. She appeared in 17 games, averaging 3.8 minutes. Epps entered the All-Star break averaging just 3.2 minutes per game so far this season. Epps has played in just 11 games so far during her rookie season, seeing five minutes or more just three times. She won't be considered a viable fantasy option until her role gets bigger, which may not be in the cards this season. That said, Epps could field more minutes in the second half of the season if the Sky continue to sit at the bottom of the Eastern Conference standings. 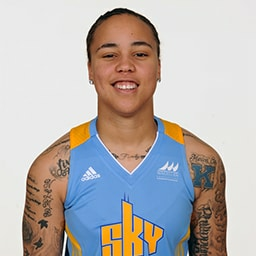 Epps has yet to play for more than seven minutes across 10 outings in her rookie season with the Sky. While all hope is not lost for a successful career in the WNBA, Epps isn't playing much of a factor when it comes to the 2017 WNBA fantasy season. However, Chicago is currently last in the Eastern Conference and might be looking to share minutes with younger players like Epps once their playoff hopes are officially dashed at some point later this season.